Heart and Stroke Foundation “make death wait” campaign: effective advocacy or unnecessary scare tactics? Death loves menopause. He loves that menopause makes women more vulnerable to heart disease and stroke. And that women are far more likely to die of a heart attack. Most of all, he loves that heart disease and stroke is the #1 killer of women. Please donate, and make death wait. Is this a legitimate way to “wake up” people to the threat of cardiovascular disease? Or unnecessary and counterproductive scare tactics? I lean toward the latter. Posted on February 12, 2012, in cardiology and tagged cardiovascular disease, Heart and Stroke Foundation, heart attacks, stroke. Bookmark the permalink. 10 Comments. I’m a Canadian, a heart attack survivor, and perhaps more to the point, a 37+ year veteran in the public relations field. ‘Make Death Wait’ is a H&SF fundraising campaign to help raise money for ongoing cardiac research. This is not an “awareness” campaign. The fact that it happens to be drawing attention to the fact that heart disease is the #1 killer of women (and doing this surprisingly effectively) is simply a nice bonus for those of us doing community education about women’s heart health. And in a recent Canadian Broadcasting Corporation opinion poll, almost 70% of respondents found that the MDW campaign is “effective, not offensive”. ‘Make Death Wait’ is “in your face” because it needs to be. In fundraising circles, it’s a truism that we tend to support what we love and what we fear. So the perennial question for non-profit fundraisers is always: how do you attract attention to your worthwhile cause amidst competing clutter and donor fatigue? Death is pretty high up on the ‘what we fear’ list, and death by cardiovascular disease is indeed what women in particular should be fearing – but regrettably, are not. My PR colleagues working over in breast cancer, for example, have done a fabulous job in educating women about their cause – so much so, in fact, that the majority of North American women believe (erroneously) that breast cancer is our biggest health threat – despite the fact that heart disease will kill six times more women this year than breast cancer will. I suppose the H&SF could have run nice little far-less-noticeable ads with kittens and flowers and rainbows instead, but why not call a spade a spade here? ‘Make Death Wait’ messages can be fairly compared to those scary warning pictures on cigarette packs. Sometimes “scare tactics” are simply what’s needed to draw attention in order to raise important funds and awareness that vital causes deserve. I’m one who would rather support a cause I love. I find these ads to be offensive and sensationalist, even kind of lurid. There is already enough fear in women’s everyday lives. Organizations that purport to care about our health would serve us better by educating us without stalker music and sexualized threats. I agree with your assessment of the H&SF menopause (mis)information, Laura, as you have accurately observed – particularly because it seems to imply that menopause and its resultant ‘hormone deficiency’ is the culprit, as opposed to the normal wear-and-tear aging process in both women and men. Interestingly, researchers in Finland have also examined the link between women’s menstrual cycles and heart disease – but their conclusions don’t credit hormones, but rather the protective effect of longterm mild iron deficiencies caused by our monthly periods – a protective effect that disappears when we stop having periods. And a number of other emerging cardiac studies now show a 3-4 fold increased risk of cardiovascular disease in women who have been diagnosed with pregnancy complications decades earlier. In fact, researcher Dr. Graeme Smith of Queen’s University in Kingston, Ontario (Canada) calls pregnancy “the ultimate cardiac stress test.” There are certainly OBGYN implications in cardiac risk factors for women. Thanks everyone for your comments. I agree with Caron that the video seems voyeuristic and stalker-like, especially the part with the woman in the bathing suit and the male voice saying he’s coming to get her. Who thought that was a good idea?! 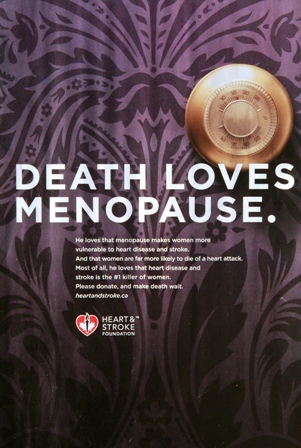 The “death loves menopause” seems unnecessarily alarmist in light of the fact that most women live many years, decades in most cases, after menopause. I’m post-menopausal myself and I don’t think I’m ready to drop dead yet. I also thought the ad was stigmatizing and demeaning to women, especially femmes d’un certain age, as the French say. I thought we were past that kind of attitude but apparently not. Why not educate women about healthy diet and exercise and things they can actually do something about, like blood pressure, cholesterol, etc. Seems like fear-mongering in ads about disease, sometimes by well-meaning agencies, is epidemic. Even I love older women cause, professional women, stay-at-home moms. I really love how women put their family first take care of whole family. They are so concerned with all their responsibility. I think this particular advertisement falls in between; a legitimate wake up and a scare tactic, and doesn’t really succeed in either format. Looking from a legitimate viewpoint, as you said, the ad doesn’t provide any information in regards to the disease, and it would do well to include voices of the people, like other ad’s in the campaign do. From a scare tactic viewpoint, I think its contradictory. The shots are indeed ‘stalkerish’, but the voice to me seems soft and almost comforting. Obviously the campaign is positive due to the underlying cause, but it’s not really successful in shocking or scaring into action, and comes across as seedy, demeaning and uninformative!